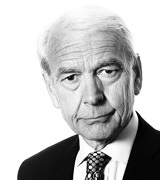 John Humphrys - Joining a Political Party: Who Should Be Allowed In? August 24, 2018, 9:37 a.m.
Arron Banks, the multi-millionaire co-founder of Leave.EU and former backer of UKIP under Nigel Farage, attempted to join the Tory Party this week. He wants to have a say on who the next Conservative leader should be. But the party turned him down. This follows a warning earlier in the week by William Hague, the former Tory leader, on the danger of ‘entryism’ – of people not committed to the basic values of the party trying to join it to pursue their own agenda. It’s a warning more usually expressed by centrists in the Labour Party. So who should be allowed to join a political party? And is entryism a good thing or a bad thing? Arron Banks and his colleague Andy Wigmore, the communications director of Leave.EU during the referendum campaign of 2016, made no bones about why they wanted to join the Tory Party. Mr Banks said: ‘We believe the battle for Brexit is now within the Conservative Party’. And Mr Wigmore said that he wanted to join the Tories ‘to ensure that if there is a leadership contest then I can influence the type of leader the country and the Tory Party need’. The two claim that initially they received a welcoming letter from the Tory Party chairman, Brandon Lewis. But then the Conservative Party announced that their applications had not been approved. The BBC reported that a Tory official had said that the two had been rejected because they were ‘likely to bring the party into disrepute’. It’s not hard to see why the two staunch Brexiteers should want to join the Conservative Party. The party’s rules allow anyone who has been a member for three months to vote in subsequent leadership elections and many people believe there is likely to be a challenge to Theresa May’s leadership in the coming months because of continuing strife within the cabinet over the government’s approach to Brexit. That strife once again became evident on Thursday, the very day that the two former UKIP members were denied admission to the Tory Party. Barely had the new Brexit secretary, Dominic Raab, published guidance on how business should prepare for a possible no-deal Brexit, adding that the country’s prospects after such an exit were good in the long-run, than the Chancellor, Philip Hammond, flatly contradicted this by publishing a letter saying a no-deal Brexit would reduce Britain’s GDP by 7.7% over fifteen years, adding about £80 billion to government borrowing by 2033. In turn, this letter led the arch-Brexiteer, Jacob Rees-Mogg, to say: ‘As a dog returneth to its vomit, so a fool returneth to his folly. The nay-sayers in the Treasury have consistently wanted to paint a bleak picture because they are frightened of taking responsibility for managing the economy without the crutch of the EU. … What Mr Hammond is doing is a reminder of why no one believes the politicised forecasts of the Treasury’. So the Prime Minister will return from her holidays to find a Conservative Party not exactly happily united under her leadership. And if she fails to persuade the European Union to accept her proposals outlined at Chequers in July for a negotiated exit from the EU, then many think a leadership challenge is inevitable. It was against this background that Lord Hague warned of the dangers of entryism in an article earlier in the week. He was responding to proposals that the rules for electing a Tory party leader be changed to give grassroots members a greater say. He opposed the idea on the grounds that it would encourage people who were not natural Tories to join the party in order to affect the outcome. Mr Banks and Mr Wigmore then came along to illustrate his point. For professional politicians like Lord Hague the worry is that this sort of entryism produces a membership they believe to be increasingly unrepresentative of voters. Indeed Lord Hague partly blames himself for being the first Tory leader to open up the leadership election to grassroots members; previously (as with all other main parties in the past) only MPs had a vote in electing the party leader. Lord Hague said that twenty years ago he had hoped that by giving the grassroots a say on who should be leader he’d encourage mass recruitment to the party. In fact party membership is now much reduced (to 124,000) leaving a membership he says isn’t remotely representative of society at large or even of Tory voters. Entryism will only make the problem worse, he believes. For politicians like Lord Hague the danger is obvious. Elections, they believe, are won in the centre ground so anything that makes a party more extreme makes it more difficult for it to win. It’s an argument that has been even more familiarly expressed in the Labour Party. Throughout its history so-called ‘moderates’ in the party have warned that if it moved far to the left in accordance with some sort of extreme socialist ideology, voters would desert it and let the Tories in. That, they say, is the lesson of the late 1970s and 1980s and it was only when ‘New Labour’ moved back to the centre under Tony Blair that it started to win elections again. But although it may historically have been the pattern that parties won elections in the centre and so had to fight off their own ideological extremists to stand a chance of doing so, it may not necessarily be the pattern in the future. Some would argue that opening up a party to ‘entryists’ can reinvigorate it without turning off the voters. This, they would argue, is the case with Jeremy Corbyn’s Labour Party. Mr Corbyn became leader in 2015 only because his predecessor, Ed Milliband, changed the party’s rules to give grassroots members the final say on who should be leader. The rule change led to an influx of new members and Mr Corbyn’s victory led to many more people joining the party. Labour’s membership now stands at over half a million. Some of the new members are from the old hard left who drifted away under New Labour; some are new recruits inspired by the idealism they see in Mr Corbyn. But what has put a spanner in the old theory that elections can be won only in the centre is Labour’s success under Mr Corbyn in the 2017 election, when he added ten percentage points to Labour’s support and denied Mrs May her majority. In other words, ‘entryism’ (on this argument) can provide a fillip to a political party because it brings in members who are genuinely passionate about something even if, to some voters, it may look extreme. Some would add that this is the lesson to be taken from the big change in American politics where the old centrist Republican Party has been transformed by entryists, initially from the evangelical right, then the Tea Party and most recently by supporters of Donald Trump. They even won the presidency. So is ‘entryism’ always a bad thing? Should political parties attempt to keep out those they think take too extreme a view of a political issue, or is letting them in a way to re-energise a party? And is it still the case or not that elections can be won only by parties standing on the centre ground?